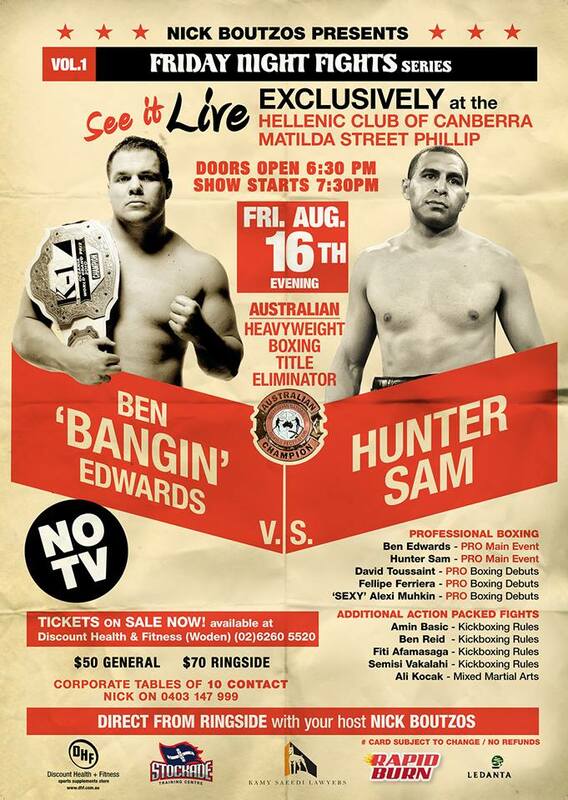 Ben Edwards and Hunter Sam are soon to go toe-to-toe on Friday, August 16. I have invested in a foam roller, which I pretty much live on. First thing in the morning, last thing at night, and before and after training. It keeps me aligned. I’m a top-heavy guy, and it puts a lot of stress on back with all the jumping around. The Roller is a chiropractor whenever I need it. Who have you fought since we last spoke? Rico Verhoeven on Capital Punishment under K1 rules in April of last year. It was a learning experience; a step up in class. He’s not a real KO guy, but he wins against top guys. I expected I’d take less damage, even if I lost. We felt it was a smart fight to take. I learned a lot from it. I wasn’t outclassed; simply beaten by a better fighter, and I’m a better fighter for the experience. Verhoeven is a mountain of a man. I fought him when he was 22 years old. It was the kicks that hurt me; the kicks that I checked and blocked! He destroyed my legs; that’s how he won. My left leg was fucked up from checking. He got the win by decision. I hurt my back after that and I spent six months on the shelf. Then, I fought Raul Catinas on October 14. That was a good match stylistically. He was ranked in the top suit for the K1. We asked for that fight and we got it; I was pleased with that performance. I’m a lot naturally bigger than he was; he has a smaller man’s bone structure. Although I was coming off injury, I was well-rested. I also had a good two months preparation. Then, I fought Paul Slowinski in March of this year. That’s always an exciting fight. Paul and I are a contrast of styles and personalities. He always puts on a good show. The fight itself, I was pretty happy. For the first round and a half, I was on fire. I feel it was up there with the best I’ve fought. Then, I tried too hard to finish him off after I dropped him. I gassed pretty hard in the last round, but I still got the job done. How was the K1 in the end? What are your future prospects with them? They wanted Badr Hari because he’s the big star. In the end they paid me not to fight so they could get Badr Hari in. K1 also changed the date 3 or 4 times for that Top-8 show. Then, they moved it a week before I was supposed to fight Paul. In the end, Hari lost to Zabit Samedov, the fighting Freddie Mercury. He [Samedov] looks like Freddie; he has a moustache and he loves it. How’s the boxing strand of your career? When do you fight next? Who do you fight next? I’m fighting Hunter Sam. If I beat him, I’ll be ranked and we’ll try to fight for the Australian heavyweight title somewhere in the next six to seven months. What’s your career trajectory looking like? Right now, in a bit of limbo. Probably going to be kickboxing, might be boxing, MMA is a possibility. In 12 months, I’ll be doing 1 thing and 1 thing only. For now, it remains to be seen what that is. We’ve currently got three offers in front of us with different companies; we don’t know what we’re going to do yet. I love MMA. I’ve been watching it longer than kickboxing; I started watching UFC as a teenager. In Canberra, we’ve got all the facilities we need, and a good circle of wrestlers and boxers. If the opportunity comes up, I’ll definitely take it. Have you fought under MMA rules before? I fought in the Combat 8, which was kickboxing with limited wrestling, wearing MMA gloves in a cage. Only 30 seconds of wrestling allowed per round. The [organizers] worked out the rules to provide as much action as possible [which meant] as much striking in MMA gloves as possible. That sounds pretty intense. What were the injuries sustained by the fighters like? A number of fractured eye sockets; guys looked like the Elephant Man. Like a massive tumor growing off their faces. Lots of structural damage. I was a mess. No concussion; I felt fine, but my nose bled for 2 days. I also had an eye patch on for 2 weeks because of bruised ocular muscles and a bruised optic nerve. My opponent’s knuckles came through and pushed my eye in. It was the worst I’ve ever been [after a fight] by far. It was pretty full on, but it was good to watch. Do you think there is greater risk involved? More risk for a heavier fighter? Under those rules? For sure. Constant striking all the time. That’s the fight game. Those are the risks, it’ll happen one day and it’ll probably happen to me. I hope I never see it. I hope that I never see it, either! Are you still working, or have you stopped full-time work for the moment? I have been working part-time. Right now, I’m trying to find some work that doesn’t screw up my training. Fighting is my priority, obviously, and my main source of income. Who is your next kickboxing fight? Catalin Morosanu, on Kings of Kombat. He’s tough as nails. He can take a punch and a leg kick (as Paul found out), and he always comes to fight. Stylistically, I don’t think you could get a more exciting fight. We might as well be standing in a phone booth for three rounds. And we’ll be standing outside, watching through the window. Good luck! This entry was posted on July 10, 2013 at 5:38 am and is filed under Journalism, Kickboxing with tags Badr hari, Ben Edwards, Canberra, Capital Punishment, Catalin Morosanu, Combat 8, Elephant Man, Freddie Mercury, Hunter Sam, K1, Kings of Kombat, MMA, Paul Slowinski, Raul Catinas, Rico Verhoeven, UFC, Zabit Samedov. You can follow any responses to this entry through the RSS 2.0 feed. You can leave a response, or trackback from your own site.